The Finals featured two teams that were fairly evenly matched on paper; however, when this game was over, one team simply dominated and smothered the other team. That team was the Shooting Stars as they had both forward lines playing hard and hustling shift after shift, while the defensemen moved the ball out of their zone smartly and quickly. They were so effective at doing this and preventing any sustained scoring flurries that their goalie had little to do the entire game. The biggest question heading into this game was if White Lightning had any answer to the second line of the Shooting Stars (which was playing more like a first line in the playoffs and throughout the season). While the Shooting Stars attacked all game and worked the ball in deep for multiple prime scoring chances, for some reason White Lightning sat back and played conservative for most of this game. It’s one thing to strategically utilize the rope-a-dope technique and play possum, but, if you never counterpunch off it, it has no effect. The only time that White Lightning actually started to play its game was with three minutes remaining. By then, it was too little too late. Interesting, heading into the playoffs, neither team was exactly playing dominating hockey. In their last five games played during the regular season, the Shooting Stars had a 1 - 4 record, while White Lightning was 3 - 2. The season series between these two teams had the Shooting Stars holding a 2 - 1 edge with an 11 - 9 goal differential. The first period started as we expected it to start, cautious and conservative. What we did notice as the period progressed was a lot of the play was in the defensive zone of White Lightning, as the Shooting Stars used their team speed effectively to pressure the defense causing turnovers that led to scoring chances. Combine that with superior positioning by the forwards and the Shooting Stars effectively made the rink look smaller than it was. Even though the Shooting Stars were carrying the play, this was still a scoreless game. That all changed when Mark Stickney took a pass on the right wing near the penalty box from Ray Dow and Jim Barber and took a rare slap shot on net with just under four minutes in the period. With no screen of players blocking his view, or sticks re-directing the shot, the goalie simply misplayed Mark’s shot as it went under his stick on the short side, giving the Shooting Stars the crucial first goal of the game. At the end of the first period, it wasn’t the 1 - 0 lead for the Shooting Stars that stood out, or how they carried the play, it was the fact that White Lightning had zero shots on net. Zero! None. Nada. Meanwhile, the Shooting Stars had 10 shots on net. As the second period started, we figured we might see White Lightning change up its lines to change up the momentum or play more of a dump and chase game. But, we saw no such changes. What we did see was more of the same from the Shooting Stars from the previous period. Capitalizing on a defensive turnover, Matt Reghitto’s shot from the right point went wide, but, there was Mark Stickney perfectly positioned in the left corner. Before the defense could react and set up in front, Mark made a bullet pass right onto the stick of John Desmond standing all alone out front at the top of the crease between both surprised defensemen. Dez emphatically slammed home the shot, giving the Shooting Stars a two-goal lead three minutes into the period. Three minutes later, the Shooting Stars essentially put this game out of reach as John Mastrocola scored his third goal in two playoff games, set up by Ray Dow and Mike Delorey, as his shot from the high slot through traffic found the back of the net. The best scoring chance for White Lightning came late in the period, as Dave Curcio had a partial breakaway but couldn’t manage to lift the ball on his finish. At the end of the second period, we saw more of what we had witnessed in the first period, as the Shooting Stars were dominating and continued to smother White Lightning, holding a commanding 3 - 0 lead, while outshooting their opponent by a whopping 25 - 4 advantage. In the third period, the sustained running fore checking attack of the Shooting Stars finally took its toll on the defense of White Lightning who was gassed. However, the defense of the Shooting Stars was starting to make their own share of turnovers rather than continue to move the ball quickly out of their defensive zone. When they did break down, there was goalie Bill Gadynski Sr. in position to make the save. It wasn’t until the last three minutes of the game until we finally witnessed White Lightning play with some desperation and started attacking. In these last three minutes, they carried the play dramatically and that hustle finally paid off. With their goalie pulled for an extra attacker, Scott Young poked in a loose ball in the crease off a wild scramble out front, with a minute to play. We still find it difficult to understand why it took White Lightning twenty-seven minutes to figure out how to find their game and play with some sense of urgency. One team (Shooting Stars) came ready to play, while the other (White Lightning) did not. The final score was a 3 - 1 victory for the Shooting Stars who dominated this game while outshooting their opponent by a 31 – 12 margin. On the way to the Finals, the Shooting Stars rode the hustling back of John Mastrocola’s 2-goals and the play of their second line in defeating Cuckoo’s Nest by the score of 3 – 1. For White Lightning, they came in as the heavy underdog, went down early in their game, came back to tie it, then stunned Blame the Girl thirty seconds into overtime, as Niko Vramis won it 2 – 1. For his efforts throughout the playoffs, John Mastrocola of the Shooting Stars was named playoff MVP as a unanimous choice. John scored a goal and hustled his way all over the rink in the Finals to go along with his 2-goals scored (including the game winner) in the semi-finals. Congratulations go out to the four first-time winners of jackets in Sergio Costa, George Medeiros, Jamie Kehoe, and Matt Reghitto. 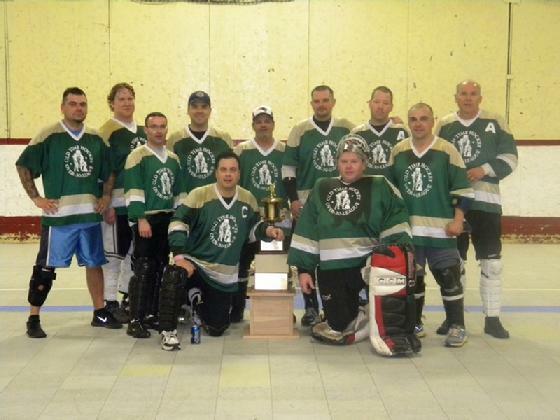 Congratulations to the Shooting Stars winter 2013 season championship team whose players include: Captain Jim Barber, Market Stickney, John Desmond, Sergio Costa, John Mastrocola, George Medeiros, Ray Dow, Jamie Kehoe, Mike Delorey, Matt Reghitto, and Bill Gardynski Sr.